Eniola Aluko (born 21 February 1987) is an English footballer who plays as a forward for Serie A club Juventus. Aluko made 102 appearances for the England national team from 2004–2016 and competed at the 2007 FIFA Women's World Cup in China, 2009 UEFA Women's Euro, 2011 FIFA Women's World Cup in Germany, 2013 UEFA Women's Euro, and 2015 FIFA Women's World Cup in Canada. At the 2012 Summer Olympics in London, she represented Great Britain. Aluko previously played for Birmingham City, Charlton Athletic, and Chelsea in England's FA Women's Premier League. She played for Saint Louis Athletica, Atlanta Beat, and Sky Blue FC in the American Women's Professional Soccer (WPS) from 2009–2011. After a short stint with Birmingham City in England's new top-division league, FA WSL, she signed with Chelsea where she played from 2012 to 2018. Born in Lagos, Nigeria, Aluko moved with her family to Birmingham in the West Midlands region of England at the age of one. She grew up playing football with her brother Sone Aluko and his friends. She also played other sports, including tennis. Aluko started her career at Leafield Athletic Ladies and subsequently played for Birmingham City Ladies' youth team under manager Marcus Bignot with future England teammate, Karen Carney. She scored on her Birmingham team debut against Leeds United, aged just 14. On 7 April 2002, 15-year-old Aluko played for Birmingham in the FA Women's Premier League Cup Final at Adams Park, as the young Birmingham team lost 7–1 to professional Fulham. City did win promotion as Northern Division champions to the Premier League National Division in 2001–02. Her goalscoring during the following 2002–03 Premier League season led Bignot to declare her "the Wayne Rooney of women's football". Aluko was named Young Player of the Year at The FA Women's Football Awards in 2003. Aluko left Birmingham to join Charlton Athletic in January 2004. She helped Charlton defeat Fulham 1–0 to win the FA Women's Premier League Cup at Underhill Stadium in March 2004. During the 2003–04 season, Aluko appeared as a second-half substitute when Charlton was defeated by FA Women's Cup finalists Arsenal 3–0 at Loftus Road in May. and lost the Premier League National Division title to Arsenal on the last day of the season, having led the way for most of the season. Aluko lifted the FA Women's Community Shield with Charlton in August 2004 after helping the team win. Her 41st minute set-up for Ann-Maire Heatherson provided the winner in a 1–0 victory against Arsenal at Broadhall Way. Pace is considered one of her great attributes and this was at the fore when she sprinted onto a through ball from Emma Coss to score the winning goal in the 2005 FA Women's Cup Final at Upton Park. Charlton beat Everton 1–0 in the Final. Aluko scored two goals in the first half of Charlton's 2–1 victory over Arsenal at the 2006 FA Women's Premier League Cup Final at Adams Park. Aluko also played in the 2005 FA Women's Community Shield (4–0 defeat at the National Hockey Stadium), the 2005 FA Women's Premier League Cup Final (3–0 defeat at Griffin Park), and the 2007 FA Women's Cup Final (4–1 defeat at the City Ground), All three defeats were to Arsenal. Her assist to Katie Holtham in the second minute of the match gave Charlton the lead in the 2007 FA Women's Cup Final. She also won the London FA Women's Cup with Charlton twice in 2005 and 2006. Following the withdrawal of support for the Charlton women's team by the parent club, Aluko joined Chelsea Ladies in July 2007. In October 2008, Aluko's playing rights were obtained by St. Louis Athletica who named her as a post-draft discovery player. She was the team's leading goal scorer during the league's inaugural season with six goals, and also led in assists with four, making her one of the main reasons Athletica was able to climb from a last place in the first two months of the season to a commanding second by the end. She missed the playoffs and the All-Star match due to national team duty. When Saint Louis Athletica folded part way through the 2010 season, Aluko signed with Atlanta Beat. She was later traded to Sky Blue FC in December 2010. When the WPS went into abeyance for the 2012 season, Aluko had already decided to return to England. She signed for Birmingham City, describing them as "more stable". In 2012, Aluko registered five goals and two assists in 17 FA WSL League and Cup appearances, as Birmingham City finished runners up to Arsenal in both competitions. City lost the 2012 FA WSL Cup Final to Arsenal 1–0 at Underhill Stadium on 10 October 2012. Birmingham did defeat Chelsea 3–2 on penalties, after it was 2–2 at the end of extra time, in the 2012 FA Women's Cup Final on 26 May 2012 at Ashton Gate to win the club's first major honour in its 44-year history. Aluko was introduced as a 63rd-minute substitute. After a single season at Birmingham, she resigned for Chelsea in December 2012. In her first season with the club, Aluko contributed six goals and three assists in 17 FA WSL League and Cup matches. Having had a poor season domestically, Chelsea reached the Final of the 2013 International Women's Club Championship, but lost 4–2 to INAC Kobe Leonessa. Aluko registered an assist in the Final and scored in the semi-final win against Sydney FC. In 2014, Aluko scored seven times and provided one assist in 20 FA WSL League and Cup appearances. Aluko's Chelsea began the last day of the 2014 FA WSL season top of the league, 2 points ahead of Birmingham City and 3 points ahead of Liverpool, but a 2–1 defeat at Manchester City cost Chelsea the Super League title on goal difference. Aluko was one of six nominations for the 2014–15 PFA Women's Players' Player of the Year, but lost out to her Chelsea teammate Ji So-yun. She did win Chelsea Ladies' Player of the Year for 2014–15 and was selected in the 2015 PFA WSL Team of the Year. In 2015, Aluko played in the first FA Women's Cup Final held at Wembley Stadium on 1 August 2015 in front of a record attendance of 30,710. Her Chelsea team defeated Notts County 1–0 to win the club's first major trophy in its history. Individually, Aluko was at the heart of Chelsea's win as she put in a Player-of-the-Match performance and provided the assist for Ji So-yun's 39th-minute winner. After Chelsea signed Fran Kirby and Ramona Bachmann, Aluko's role in the team diminished. It was announced on 16 May 2018 that Aluko would receive a free transfer from Chelsea when the 2017–18 season ended four days later. She marked her final appearance by scoring and had made occasional appearances, predominantly as a late substitute, in the side which remained unbeaten throughout the whole league season. Aluko signed for Serie A club Juventus on 6 June 2018. Aluko was called into the England set-up at the age of 14. She chose to remain loyal to the English coaches who had given her the opportunity to play international football, but said: "The main thing for me is for people to understand that choosing to play for England doesn't mean that I don't support Nigeria. I'm as much Nigerian as I'm British. Of course Nigeria means a lot to me, it's part of me, but I've been brought up by English coaches." Having represented England at Under-17 level, Aluko scored on her debut at Under-19 level and appeared in the UEFA Under-19 European Championship Finals in Germany in July 2003 while aged only 16 years. She later played at Under-21 level, before making her senior debut, aged 17, against the Netherlands in September 2004. Her first senior goal came against the Czech Republic at Walsall in May 2005, and she added two more in the 13–0 away win against Hungary that October. Aluko played in UEFA Women's Euro 2005, despite a clash with her A-Level studies. She sat a history exam on the morning of England's 2–1 defeat to Denmark. In the final group game against Sweden Aluko almost scored a bizarre equaliser, but was left disappointed as hosts England lost 1–0 and exited the competition. At the FIFA Women's World Cup 2007, Aluko featured in group matches against Japan and Argentina, as well as the 3–0 quarter-final defeat by the United States. After the tournament, she was critical of The Football Association and the level of financial support provided to England's top female players. Aluko featured much more prominently at UEFA Women's Euro 2009, scoring in the group match win over Russia and adding two more in the quarter-final victory over hosts Finland. She also provided an assist for Kelly Smith's opening goal in the semi-final against the Netherlands. In the final Aluko made little impression on the left-wing as England were mauled 6–2 by Germany in Helsinki. Aluko netted against Switzerland in September 2010 as England qualified for the FIFA Women's World Cup 2011. During the final tournament, Aluko responded angrily to public criticism of her performance in the 1–1 draw with Mexico, in which she wasted multiple goalscoring opportunities. She was substituted at half–time in the following group match against New Zealand, and dropped to the bench for the final group match with Japan, playing the last half an hour of England's 2–0 win. Aluko was an unused substitute as England were eliminated by France at the quarter final stage. As England qualified for the 2015 FIFA Women's World Cup, Aluko finished as the joint-top scorer in qualifying with 13 goals, which included her first hat-trick in a 10–0 thumping of Macedonia, and braces against Turkey and Ukraine. At the Finals tournament, Aluko started both of England's first two group matches, a 1–0 defeat by France and a 2–1 win over Mexico. Having missed the last group match and the knockout stages, Aluko reappeared as a 61st-minute substitute in the third-place play-off with Germany. England defeated Germany for the very first time, 1–0 after extra time to win bronze medals. Aluko has not been called up to the national team since May 2016. Earlier in 2016, she was paid £80,000 by the Football Association despite a barrister stating there was not sufficient evidence to Aluko's claims of racism and bullying by head coach Mark Sampson and other staff. The Football Association later publicly apologised to Aluko after the same barrister found racist remarks were made to her and teammate Drew Spence, following a third investigation. At UEFA Women's Euro 2017, Aluko worked as a pundit for Channel 4 while her replacement as Lionesses centre-forward Jodie Taylor won the Golden Shoe as tournament top-goalscorer. When England's players—led by forward Nikita Parris—ran to celebrate with coach Sampson after scoring in their next match against Russia, Aluko publicly criticised her former team-mates, accusing them of selfishness, lacking respect and requiring diversity training. In an interview with The Daily Telegraph, England right-back Lucy Bronze questioned whether Aluko was now good enough to be in England's squad. Aluko remained surprised and disappointed at a perceived lack of support for her position from England's current players. The FA investigation had received substantial evidence of Aluko's own "negative" behaviour, which included an assault on an unnamed team-mate. Sampson's successor as England coach, Phil Neville, did not select Aluko either, explaining: "First and foremost, is she good enough to play for England? Is she scoring goals and playing well? Those are the first main factors and then you have to look at the bigger picture with who else is in her position – have we got competition for places?" In June 2012, Aluko was named in the 18–player Great Britain squad for the 2012 London Olympics. She made her Great Britain debut, in its first ever official fixture, in a friendly goalless draw with Sweden at the Riverside Stadium, Middlesbrough on 20 July 2012, starting and playing the entire match. At the Olympic football tournament, Aluko started all three groups matches, which included wins over New Zealand, Cameroon and in front of over 70,000 at Old Trafford, twice Olympic silver-medalists Brazil. Aluko won a penalty in the Brazil match, which Kelly Smith missed. Britain advanced to the quarter-finals as group winners. Aluko also started as Britain lost 2–0 to Canada in the quarter-finals, courtesy of two early goals, and ended hopes of at least reaching a match for an opportunity at a medal. Aluko had a strong appeal for a second-half penalty dismissed. Despite England's third-place finish at the 2015 FIFA Women's World Cup, which Aluko was a part of, earning Great Britain one of the three available European slots for the 2016 Rio Olympics, it was already decided Great Britain would not send a women's team to the event. It means Aluko may not add to her tally of five Great Britain caps, with participation at the 2020 Tokyo Olympics the next earliest available opportunity. While playing for England during Women's Euro 2005, Aluko took her A levels at Cadbury College, Birmingham. She subsequently went to study Law at Brunel University, where she graduated with a First class degree in 2008. In July 2009 it was announced that Aluko would spend the 2009–10 US off-season studying for the New York bar exam before taking a similar exam in England, her aim being to have an entertainment law practice in both England and the United States. Her younger brother Sone plays for Reading and was an England youth international, but in May 2009 accepted a call-up to represent Nigeria. Her father is a former MP in Nigeria, while Bolaji Aluko, a chemical engineering professor, is her uncle. As of November 2010[update], Aluko was an active contributor on Yin & Yang, a popular culture website. In September 2014, Aluko appeared on the BBC's football show, Match of the Day, the first woman to appear as a pundit on the show. She was featured along with her national teammates in the EA Sports' FIFA video game series starting in FIFA 16, the first time women players were included in the game. In August 2016, she signed a multi-year endorsement deal with Under Armour and was the first woman athlete in the United Kingdom to do so. ^ a b "FIFA Women's World Cup Canada 2015™: List of Players: England" (PDF). FIFA. Retrieved 5 July 2015. ^ "Eniola Aluko". Soccerway. Retrieved 15 May 2018. ^ a b c "Eniola will not fly". BBC Sport. 14 May 2005. Retrieved 28 July 2009. ^ a b "Athletica's Aluko prepares for life as an attorney". STL Today. 22 July 2009. Archived from the original on 26 July 2009. Retrieved 28 July 2009. ^ Moore, Glen (21 March 2015). "Women's football in Britain: Doing it for themselves". The Independent. Retrieved 15 September 2017. ^ a b "Eniola is the Top Young Gun". Women's Soccer Scene. 3 June 2003. Retrieved 22 April 2011. ^ Emma Stoney (19 June 2003). "Big year for Bignot". Givemefootball.com. Archived from the original on 2 April 2012. Retrieved 22 April 2011. ^ Tom Wells (3 October 2004). "THE NEW ROONEY; (And she's a schoolgirl from Birmingham)". Sunday Mercury. Retrieved 22 April 2011. ^ Matthew Cook (7 April 2002). "Birmingham City 1–7 Fulham". The FA. Retrieved 30 March 2011. ^ "English Football (women) 2001/02". Rec.Sport.Soccer Statistics Foundation. Retrieved 4 August 2015. ^ a b c "Eniola Aluko column: Why FA Cup win was best day of my career". BBC Sport. 3 August 2015. Retrieved 4 August 2015. ^ Emma Stoney (24 February 2003). "Football: Birmingham find their own 'Roonaldo' WOMEN'S FOOTBALL". The Birmingham Post. Retrieved 22 April 2011. ^ "Charlton sign Aluko". Fair Game. 2 January 2004. Retrieved 28 July 2009. ^ "Ladies Lose Final". Fulham. 28 March 2004. Retrieved 2 August 2015. ^ "Charlton still on course for treble". The FA. 28 March 2004. Retrieved 2 August 2015. ^ "Arsenal enjoy Fleeting moment". The Guardian. 4 May 2004. Retrieved 2 August 2015. ^ "Top Gunners! Arsenal are the Champions". WSS. 16 May 2004. Retrieved 2 August 2015. ^ "It's the biggest game in women's football – Jess". WSS. 30 April 2004. Retrieved 2 August 2015. ^ "Ladies: Arsenal 0–1 Charlton". Arsenal FC. 11 August 2004. Archived from the original on 24 September 2015. Retrieved 2 August 2015. ^ "Charlton lift FA Women's Cup". Fair Game. 2 May 2005. Retrieved 28 July 2009. ^ "Charlton lift the FA Cup". WSS. 3 May 2005. Retrieved 2 August 2015. ^ "Eni at the double for jubilant Addicks". WSS. 8 May 2007. Retrieved 2 August 2015. ^ "Gunners shoot down Charlton". WSS. 5 August 2005. Retrieved 2 August 2015. ^ "White-Hot Arsenal recapture League Cup". WSS. 6 March 2005. Retrieved 2 August 2015. ^ "Ladies: Arsenal 4–1 Charlton". Arsenal FC. 7 May 2007. Retrieved 2 August 2015. ^ "Managers call for Wembley to host final after Gunners wrap up historic quadruple". The Guardian. 8 May 2007. Retrieved 2 August 2015. ^ "Charlton women devastated". Fair Game. 24 June 2007. Retrieved 28 July 2009. ^ "Chelsea sign Stoney & Aluko". Fair Game. 6 July 2007. Retrieved 28 July 2009. ^ "Beat agrees to terms with Solo, Ellertson, and Aluko". Women's Professional Soccer. 6 January 2010. Archived from the original on 6 July 2010. Retrieved 9 July 2011. ^ "England's Kelly Smith devastated by US league cancellation". BBC Sport. 31 January 2012. Retrieved 1 February 2012. ^ "Eniola Aluko – 2012 FA WSL". Football Line-Ups. Retrieved 3 August 2015. ^ "Eniola Aluko – 2012 FA WSL Cup". Football Line-Ups. ^ "Ladies: Arsenal 1–0 Birmingham City". Arsenal FC. 28 October 2012. Retrieved 3 August 2015. ^ "FA Women's Cup: Birmingham beat Chelsea on penalties in final". BBC Sport. 26 May 2012. Retrieved 3 August 2015. ^ "Blues land maiden Women's Cup". The FA WSL. 26 May 2012. Retrieved 3 August 2015. ^ "Chelsea Ladies re-sign Eniola Aluko from Birmingham City". BBC Sport. 6 December 2012. Retrieved 6 December 2012. ^ "Eniola Aluko – 2013 FA WSL". Football Line-Ups. Retrieved 3 August 2015. ^ "Eniola Aluko – 2013 FA WSL Cup". Football Line-Ups. Retrieved 3 August 2015. ^ "Eniola Aluko – 2013 IWCC". Football Line-Ups. Retrieved 4 August 2015. ^ "Eniola Aluko – 2014 FA WSL". Football Line-Ups. Retrieved 3 August 2015. ^ "Eniola Aluko – 2014 FA WSL Cup". Football Line-Ups. Retrieved 4 August 2015. ^ "Liverpool Ladies pip Chelsea to WSL title on dramatic final day". BBC Sport. 12 October 2014. Retrieved 3 August 2015. ^ "Women's PFA Players' Player of the Year: Nominees". PFA. 16 April 2015. Retrieved 8 August 2015. ^ "PFA Women's Player of the Year: The Contenders". Sky Sports. 17 April 2015. Retrieved 8 August 2015. ^ "PFA Women's Players' Player of the Year: Ji So-Yun". PFA. 26 April 2015. Retrieved 8 August 2015. ^ "Winner: Ladies' Player Of The Year 2015". Chelsea LFC. 30 May 2015. Retrieved 8 August 2015. ^ "Eniola Aluko wins Player of the Year Award". Complete Sports Nigeria. 28 May 2015. Retrieved 20 January 2018. ^ "WSL Team of the Year 2015". PFA. 26 April 2015. Archived from the original on 31 May 2015. Retrieved 8 August 2015. ^ "WSL Team of the Year: Lucy Bronze is sole Liverpool player". BBC Sport. 26 April 2015. Retrieved 8 August 2015. ^ "Chelsea's Eniola Aluko 'relieved' after Women's FA Cup win". Sky Sports. 1 August 2015. Retrieved 2 August 2015. ^ "Women's FA Cup final: Chelsea Ladies 1–0 Notts County Ladies". BBC Sport. 1 August 2015. Retrieved 2 August 2015. ^ "Eniola Aluko: Forward to leave Chelsea when season ends on Sunday". BBC Sport. 16 May 2018. Retrieved 23 May 2018. ^ "Liverpool Ladies 2–3 Chelsea Ladies". BBC Sport. 20 May 2018. Retrieved 23 May 2018. ^ "Eniola Aluko signs for Italian champions Juventus". BBC Sport. 6 June 2018. Retrieved 7 January 2018. ^ Farayi Mungazi (14 May 2005). "Eniola will not fly". BBC Sport. Retrieved 22 April 2011. ^ "Gunners shoot six". BBC Sport. 1 September 2002. Retrieved 28 July 2009. ^ "Marley confirms England squad". BBC Sport. 9 July 2003. Retrieved 28 July 2009. ^ Tony Leighton (20 September 2004). "Holland 1–2 England". The Guardian. Retrieved 2 January 2011. ^ "England 4–1 Czech Republic". BBC Sport. 27 May 2005. Retrieved 1 January 2011. ^ "England Women ease to biggest win". BBC Sport. 27 October 2005. Retrieved 12 September 2010. ^ Pete Oliver (4 June 2005). "Educated Aluko holds Euro dream". BBC Sport. Retrieved 22 April 2011. ^ "Denmark v England as it happened". BBC Sport. 8 June 2005. Retrieved 22 April 2011. ^ "Aluko hoping for positive effect". BBC Sport. 12 June 2005. Retrieved 22 April 2011. ^ "Eniola Aluko". FIFA. Retrieved 22 April 2011. ^ Jacqui Oatley (15 November 2007). "England women angry at £40 wage". BBC Sport. Retrieved 22 April 2011. ^ "England women 3–2 Russia women". BBC Sport. 28 August 2009. Retrieved 22 April 2011. ^ "Finland women 2–3 England women". BBC Sport. 3 September 2009. Retrieved 22 April 2011. ^ "England Ladies 2–1 Holland Ladies". BBC Sport. 6 September 2009. Retrieved 7 September 2009. ^ Mark Ashenden (12 September 2009). "England 2–6 Germany". BBC Sport. Retrieved 22 April 2011. ^ "Swiss Women 2–3 England Women". BBC Sport. 16 September 2010. Retrieved 22 April 2011. ^ Nigel Adderley (30 June 2011). "England striker Eniola Aluko affected by Twitter abuse". BBC Sport. Retrieved 10 July 2011. ^ Tom Rostance (1 July 2011). "Women's World Cup: New Zealand 1–2 England". BBC Sport. Retrieved 10 July 2011. ^ Jonathan Stevenson (5 July 2011). "Women's World Cup: England 2–0 Japan". BBC Sport. Retrieved 10 July 2011. ^ Chris Bevan (9 July 2011). "Women's World Cup: England 1–1 France (France win 4–3 on pens)". BBC Sport. Retrieved 10 July 2011. ^ "Aluko elated with her 13 goals in World Cup qualifying". The FA. 17 September 2014. Retrieved 4 August 2015. ^ "2015 World Cup qualifier: England 8–0 Turkey". BBC Sport. 26 September 2013. Retrieved 4 August 2015. ^ "Dowie and Aluko at the double for rampant England". The FA. 14 May 2014. Retrieved 4 August 2015. ^ "Spot on Fara Williams secures bronze for Lionesses". The FA. 5 July 2015. Retrieved 4 August 2015. ^ "Germany 0–1 England (aet)". The Guardian. 5 July 2015. Retrieved 4 August 2015. ^ "Mark Sampson: England boss cleared after 'bullying' complaint by Eniola Aluko". BBC Sport. 7 August 2017. Retrieved 7 August 2017. ^ Taylor, Daniel (17 August 2017). "Eni Aluko 'hush-money' case: FA bows to pressure and reveals findings". The Guardian. Retrieved 14 September 2017. ^ Rumsby, Ben (14 September 2017). "Mark Sampson racist abuse case poised to reopen after second alleged victim comes forward". The Telegraph. Retrieved 14 September 2017. ^ "Eniola Aluko hits out at 'selfish' England Women after public show of support for under-fire boss Mark Sampson". The Independent. 20 September 2017. Retrieved 16 June 2018. ^ Edwards, Luke (3 November 2017). "Lucy Bronze: 'I don't speak to Eni – I'm not sure everything is sorted'". The Daily Telegraph. Retrieved 16 June 2018. ^ Magowan, Alastair (9 November 2017). "Eniola Aluko disappointed and surprised by players not supporting her stance". BBC News. Retrieved 16 June 2018. ^ Dickinson, Matt (25 November 2017). "Revealed: why Mark Sampson axed 'negative' Eni Aluko". The Times. Retrieved 16 June 2018. ^ Trehan, Dev (25 February 2018). "England boss Phil Neville will pick Eni Aluko if Chelsea Ladies striker is in form". Sky Sports. Retrieved 16 June 2018. ^ "Women's warm-up ends in stalemate". BBC Sport. 20 July 2012. Retrieved 13 August 2015. ^ "Great Britain and Sweden draw blank". WSS. 20 July 2012. Retrieved 13 August 2015. ^ "Steph strikes as GB start with win". WSS. 25 July 2012. Retrieved 13 August 2015. ^ "Ladies: Great Britain 1–0 New Zealand". Sky Sports. 25 July 2012. Retrieved 13 August 2015. ^ "GB ease into quarter finals". WSS. 28 July 2012. Retrieved 13 August 2015. ^ "Team GB dispatch Cameron 3–0". The Telegraph. 28 July 2012. Retrieved 13 August 2015. ^ "Super Steph does it again!". WSS. 31 July 2012. Retrieved 13 August 2015. ^ "Steph Houghton sinks Brazil in Team GB's third straight win". The Guardian. 31 July 2012. Retrieved 13 August 2015. ^ "GB Dreams Ended by Canada". WSS. 3 August 2012. Retrieved 13 August 2015. ^ "Olympics football: Great Britain 0–2 Canada". BBC Sport. 3 August 2012. Retrieved 13 August 2015. ^ "Rio 2016: FA scraps plans for Great Britain football teams". BBC Sport. 30 March 2015. Retrieved 13 August 2015. ^ "Team GB want women's football side at 2020 Olympics in Tokyo". BBC Sport. 29 June 2015. Retrieved 13 July 2015. ^ "Educated Aluko holds Euro dream". BBC Sport. 4 June 2005. Retrieved 28 July 2009. ^ "England squad for Germany friendly". Fair Game. 14 July 2008. Retrieved 28 July 2009. ^ "Kelvin Etuhu opts for Nigeria". BBC Sport. 26 May 2009. Retrieved 28 July 2009. ^ Tunde Adekeye (23 July 2008). "Eniola Aluko: Goal Poacher And Brilliant Lawyer". Nigerian Muse. Retrieved 22 April 2011. ^ "Yin & Yang – The Family". Yin & Yang. 1 January 2011. Archived from the original on 8 January 2011. Retrieved 5 January 2011. ^ "Eniola Aluko makes history as first female Match of the Day pundit". The Guardan. 20 September 2014. Retrieved 2 October 2014. ^ "Fifa 16: EA Sports game to feature women for first time". BBC Sport. 28 May 2015. Retrieved 14 September 2017. ^ Barnes, Katie (28 September 2015). "Why 'FIFA 16' is a Landmark for Women". ESPN. Retrieved 3 January 2016. ^ Connelly, Tony. "Chelsea's Eniola Aluko on being Under Armour's first female athlete in the UK". The Drum. Retrieved 15 September 2017. 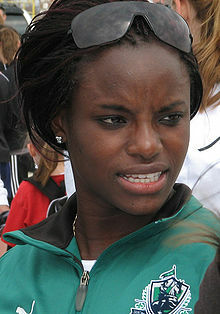 Wikimedia Commons has media related to Eniola Aluko.